If there’s a “sure thing” you can expect at WWDC, it’s that Apple will preview new versions of its operating systems. Sure enough, the company spent a considerable portion of Monday’s keynote telling us about OS X Yosemite, the next major revision to its desktop OS. And major it is, starting with the iOS 7-inspired visual makeover. But though many expected that facelift to be the day’s biggest OS X news, Yosemite’s preview was most impressive for the slew of major new features Apple revealed. Here are eight new features—among those we know about so far—that we wish we didn’t have to wait for. Not surprisingly, given how many of us own both Macs and iOS devices, our favorite new “feature” is actually a handful of features that aim to make it easier to work with, and switch between, all those devices. Apple labeled this group of features Continuity, and the idea behind them is to make switching from your Mac to your iPhone or iPad, or vice versa—to use the best device for a particular task—as seamless as possible. Shared AirDrop AirDrop, Apple’s easy-to-use feature for getting files from one device to another, debuted for Macs back in 2011 and for iOS last year. Yet the OS X and iOS versions weren't—and still aren’t—compatible. One of our big wishes for iOS 8 was for Apple to fix this, and with Continuity it has: AirDrop will work between Macs and iOS devices, so you can easily send a file from your Mac to your nearby iPhone, or from your iPad to your Mac. Typing an email on your iPhone? Handoff lets you quickly switch to your Mac. Handoff If you start working on a file or email message, or viewing a website, on your iPad or iPhone, there’s currently no easy way to switch over to your Mac and complete the task there. But with a Mac running Yosemite and an iOS 8 device nearby, each will watch the other to see what you’re doing, and offer to let you shift that activity to the other device. Mac/iPhone phone integration The combination of Yosemite and iOS also makes it easier to use your phone and Mac together. For example, whenever your iPhone is nearby and a call comes in, your Mac can display caller-ID information, and you can even accept the call on your Mac, using it as a speakerphone. You can also initiate calls on your iPhone from your Mac: just click a number in the Contacts app, or even on a webpage or in an email message, text message, or calendar event. The Instant Hotspot feature makes it simple to use your iPhone to get online. Instant Hotspot Speaking of phone integration, you’ve long been able to use your iPhone as a cellular-data hotspot when you need to get your Mac online but you’re out of range of a Wi-Fi network. Under Yosemite and iOS 8, the new Instant Hotspot feature displays your iPhone in OS X’s systemwide Wi-Fi menu (assuming, of course, that your iPhone is on and nearby). Choose it, and your iPhone automatically sets up a secure Wi-Fi hotspot and your Mac connects to it—no messy, multi-step configuration necessary. Apple says that the menu will even display your phone’s signal strength and battery life, and your Mac will disconnect from the phone when not accessing the network. With iCloud Drive, you can sync and easily access any kind of data. We asked for more-open, more-Dropbox-like storage, and we got it. Apple’s new iCloud Drive feature combines the existing per-app storage simplicity with a feature that works similarly to Dropbox. Click iCloud in the sidebar of a Finder window, and you can view all your iCloud-stored documents. Documents that have been saved in, and associated with, particular apps (Pages, for example) are grouped in app-specific folders; other documents, including those you’ve manually dragged into the iCloud folder, appear loosely (or in any folders you create). Any data in the iCloud folder is synced with iCloud and available from all your Macs, and on all your iOS devices. And iOS apps will be able to view your iCloud Drive, making it easy to open those documents in your iOS app(s) of choice. Apple’s even making iCloud Drive available on Windows. Yosemite gains an iOS-like Today view in Notification Center. Believe it or not, Spotlight has been around for almost a decade (since Mac OS X 10.4), but for the most part, it’s been limited to searching your drive for data; looking up dictionary definitions; and sending Web searches to your browser—and in our experience, many people don’t even know it can do the latter two. Yosemite brings Spotlight its first major overhaul. In addition to looking different (it now pops up in the middle of the screen, rather than sticking to the upper-right corner, and it inherits Yosemite’s new flat look), it also gains quite a few skills. For example, though Spotlight still searches local content, its results will also include apps from the App Store, media from the iTunes and Books Stores, and news from popular websites. It can offer suggestions from Bing, Wikipedia, and Maps—the latter letting you type sushi to find local restaurants, for example. It can give you movie showtimes, lets you perform instant unit conversions, and even offers auto-completed suggestions for search terms. Yosemite's Spotlight can do more than just find your files. Sometimes email attachments are just photos. But oftentimes they’re PDFs you need to sign (or otherwise annotate), or images you’d like to mark up. Yosemite’s appropriately named Markup feature lets you do just that right from within a reply window in Mail. Instead of having to save the file to your drive, open it in a different app, save it, and then attach it to your outgoing email message, Markup lets you annotate on the fly and then send the results with a click. According to Apple’s website and keynote demo, you’ll be able to add signatures; draw lines, shapes, and arrows; add callout text and cartoon bubbles; and even zoom in on part of an image. If you have a Magic Trackpad (or MacBook trackpad), you’ll be able to draw using your fingertip. With Markup, you can annotate attachments right from within Mail. This approach works, but it still requires the sender to be tech savvy enough to configure such a workflow. 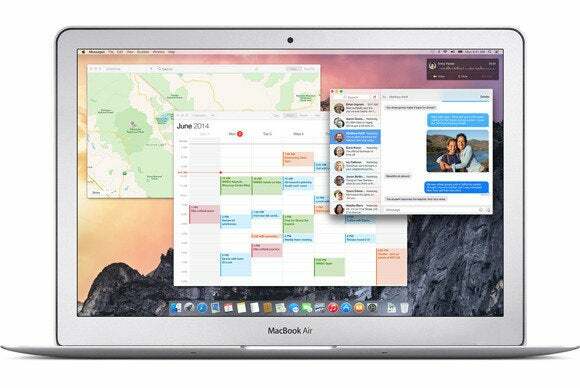 With Yosemite’s Mail Drop feature, Apple hopes to make the process seamless. You just add your attachment like you normally would, compose your message, and then send. OS X uploads—automatically and invisibly—larger files to iCloud. If your recipient is using Mail in Yosemite, OS X will download—again, automatically and invisibly—the file and present it in the message just like any other attachment; if the recipient is using another email client, another platform, or an earlier version of OS X, the message will contain a link for downloading the file. Apple says Mail Drop will work with files (or even folders of files) up to 5GB in size, and that files are encrypted in transit for security. Over the past couple years, Macworld editors have had so many problems with Messages for OS X—and the underlying iMessage service—that many of us have shifted to using AIM on third-party clients. But based on the improvements Apple talked about during the keynote, some of us just may switch back. Click that little microphone icon to send an audio message. It's even easier on iPhone. For starters, group messaging has finally gotten some attention. While in a group-messaging discussion, you’ll be able to easily add and remove participants, to change the thread name (“Vacation Planning”) for easier identification on all your devices, and to leave a thread. And each member in the conversation can share his or her location, a la Find My Friends, which should be great for families and friends traveling together—or, say, editors at a tech publication covering a big conference. For those times when your friend(s) get a bit too chatty, you’ll be able to toggle Do Not Disturb for a specific thread, instead of having to enable it for your entire device. Yosemite will also make it easy to view all media in a thread, sans messages. Although the OS X Beta Seed Program debuted back in April, Yosemite marks the first time a major new version of OS X has been available to the general public before it’s actually released. As Apple puts it, anyone can “join the OS X Beta Program and help make the next release of OS X our best yet.” Specifically, the public beta of OS X Yosemite is available to the first million people who sign up. Apple is letting—nay, encouraging—end users to test beta versions of Yosemite. Of course, as Mac geeks, we’re excited by the opportunity to get our hands on Yosemite several months early. But it’s not something we recommend to everyone. Beta software is, by definition, not final-release quality, so there are bound to be bugs, some of them serious. If you’re even considering signing up for the Beta Seed Program, you should have multiple good backups, and you should ideally do your testing on a Mac that isn’t your main computer. But if you have the resources to do these things; you’re somewhat tech savvy; you’re willing to put in the time to report bugs that you come across; and—perhaps most important—you understand what beta means (and won’t blame Apple or third-party developers for any problems you might have, or data you might lose), then, by all means, sign up. Flat, elegant Dock, we've missed you. This isn’t a big one, but it’s a welcome one: One of the little things a number of Macworld editors miss from Mountain Lion and earlier versions of OS X was the two-dimensional, translucent Dock. Apple did away with this elegant, easy-to-view Dock way back in Mac OS X 10.5, but with a quick Terminal tweak (or the use of a third-party tweaking utility), you could still opt for it up until OS X 10.8. But in OS X 10.9 Mavericks, Apple removed even that hidden option—you were stuck with the (in my opinion) ugly, cluttered, 3-D appearance. With Yosemite’s new interface, the flat, translucent dock is back. And I love it.